Hooding and Diploma speaker Marcia Buck is clinical pharmacy coordinator, U.Va. Children’s Hospital; professor of pediatrics, U.Va. 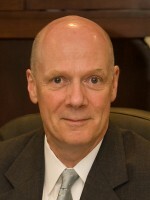 School of Medicine; and affiliate clinical professor, VCU School of Pharmacy. “Wherever you go, you will be part of the School of Pharmacy family.” With those words, Dean Joseph T. DiPiro congratulated Pharm.D. and graduate degree candidates assembled for the 2017 Hooding and Diploma Ceremony. Graduation speaker Marcia Buck of the school’s U.Va. Division, who is president of the American Society of Consultant Pharmacists, admitted that looking to the future can be overwhelming and even scary. “You have the tools to succeed,” she assured graduates. Her suggestions for success included looking for and accepting mentors and serving as a preceptor if the opportunity presents itself. 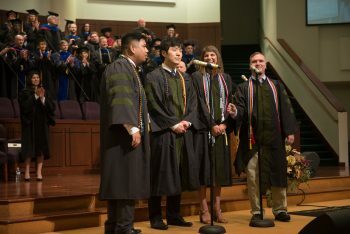 A rare treat during the Hooding and Diploma Ceremony was the singing of the National Anthem by Pharm.D. students Alvin Maraya (left), Michael Lee, Erin Hickey and Jeff McKenzie. The remaining Pharm.D. students matched with residencies, received fellowships or will pursue graduate education. 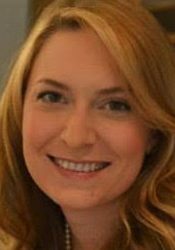 Elizabeth Young is headed for a PGY1 residency at Purdue University College of Veterinary Medicine. Graduate degree-holders will go on to serve as postdocs, teach or work in the pharmaceutical industry. Hebing Liu, for example, will join several VCU School of Pharmacy alumni who have gone on to work for the U.S. Food and Drug Administration. VCU School of Pharmacy professor Michael Hindle and VCU School of Engineering professor Worth Longest have received a $2.4 million, four-year renewal of a National Institutes of Health grant originally awarded in 2011. The original and current R01 grants were provided by the National Heart, Lung and Blood Institute. 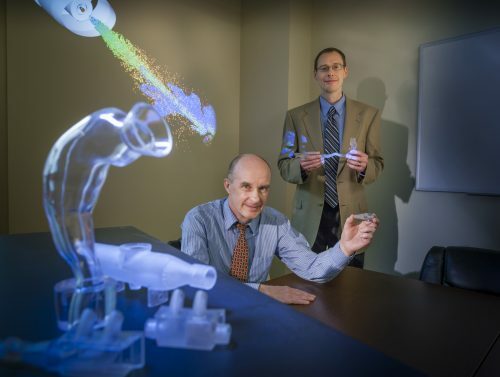 As co-principal investigators, Hindle and Longest have been using computational fluid dynamics simulations and realistic in vitro airway models to find ways to improve aerosol drug delivery during various forms of non-invasive ventilation (respiratory support provided via a mask or nasal prongs). Administering aerosols to the lungs via the nose is convenient for patients receiving non-invasive ventilation. 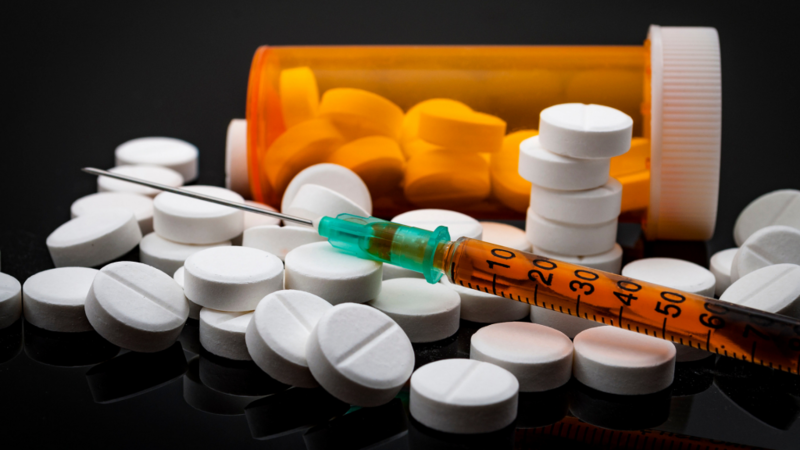 But as the aerosol is delivered to its destination in the lungs, medication can be lost and wasted, drug effects can be reduced and side effects potentially can be increased. Longest and Hindle have developed a new small particle, excipient enhanced growth aerosol device that demonstrates more efficiency in reaching the lungs, reduction of variability in dose effects among subjects and better targeting of small airways. The interdisciplinary study will be performed completely within VCU by Hindle and Longest along with the School of Medicine’s Aamer Syed, Chris DeWilde and Anna Priday, VCU Johnson Center for Critical Care and Pulmonary Research; Jamal Zweit and Sundaresan Gobalakrishnan, Center for Molecular Imaging; and Mel Fratkin and Jianqiao Luo, Department of Radiology. Longest and Hindle have collaborated on a number of research projects over the years to improve aerosol inhaler mouthpiece technology, develop novel aerosol inhaler concepts and investigate aerosol deposition in realistic oropharyngeal models. Initial seed funding for this project was supported by the Innovation Gateway at VCU and an Interdisciplinary Research Grant from the Schools of Dentistry, Pharmacy and Engineering. Last year, Hindle was named the first recipient of the School of Pharmacy’s Peter R. Byron Distinguished Professorship. The professorship was established by Byron, the former department chairman who laid the foundation for the Department of Pharmaceutics’ Aerosol Research Group. Hindle earned his Ph.D. in pharmaceutical sciences from the University of Bradford in England. He completed a postdoctoral fellowship in pharmaceutics at VCU School of Pharmacy before joining the Department of Pharmaceutics faculty in 1997. Learn more about his research. MCV School of Pharmacy alumnus and Richmond native Norman L. Hilliard, 88, died Nov. 19, 2016. Survivors include daughter Catherine Miles and son-in-law Caleb Miles; daughter Norma Anderson; grandsons Caleb H. Miles, Taylor Miles and Andy Anderson; and sister Frances Hilliard Pritchard. He was predeceased by his wife of 65 years, Lola West Hilliard, who died in 2013. Norman and Lola Hilliard were familiar figures on the MCV Campus; in fact, that’s where they originally met. 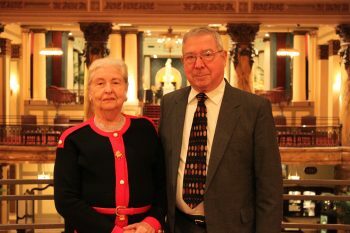 Daughter Norma Anderson says her mom, a nurse, was affiliated with MCV Hospitals in the late 1940s when Norman Hilliard “saw her walking around and thought she was kind of cute!” The two soon wed, and Lola Hilliard is the one who suggested that her husband attend pharmacy school. “She put him through school, spurred him on,” says Anderson. 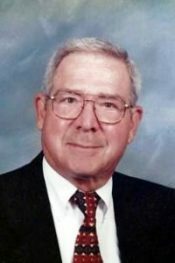 Hilliard, active in both Kappa Psi and Rho Chi fraternities as a student, graduated in 1953. His career included retail pharmacy practice and serving as a pharmacy officer in the U.S. Air Force, where he attained the rank of captain. Later, he returned to his alma mater to teach and also directed its continuing education program. Anderson has fond memories of visiting her father’s office at the School of Pharmacy, sitting in on one of his lectures, dining at the Skull and Bones and playing with other alums’ kids at VPhA conventions in Virginia Beach. She also recalls her dad working behind the counter at Lafayette Pharmacy in Richmond’s Beverly Hills Shopping Center. In the late 1960s, Hilliard went back to school, earning his M.Ed. at VCU in ‘70. That degree led to a career in continuing studies on the university level. In the 1980s, both daughters completed degrees at VCU, as well: Catherine in occupational therapy and Norma in communication arts and design. 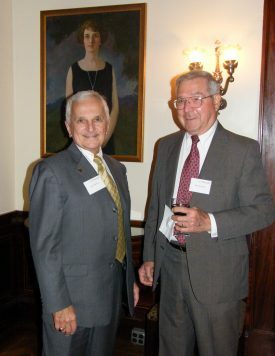 In 2008, Hilliard attended the School of Pharmacy’s 50th Anniversary Graduate Alumni Reunion along with fellow emeriti faculty Marvin Boots, John Ruggiero, Bill Soine, Harold Smith and Jim Stubbins. Asked at the time if she or her husband had any current news to share, Lola Hilliard laughed. “No, we’re just growing old!” she said. But it was clear the two weren’t slowing down. Hilliard enjoyed playing golf regularly, his membership in the Lions Club and dinners with a rogue spin-off group, the ROLEOs (Retired Old Lions Eating Out). And together, the Hilliards attended many of his School of Pharmacy reunions as well as Galen Society Dinners for leadership donors. As Yanchick noted, Hilliard was nothing if not a proud alumnus. In an article he wrote for the Scarab alumni magazine in 1972, Hilliard discussed the importance of interprofessionalism and expanding the School of Pharmacy’s clinical component to bring pharmacists into line with the rest of the health-care team. A celebration of Norman Lynwood Hilliard’s life will begin at 1:30 p.m. Dec. 4 at Trinity United Methodist Church, 903 Forest Ave. in Richmond. A reception will follow. In lieu of flowers, the family requests that donations be made to the VCU School of Pharmacy, 410 N. 12th St., P.O. Box 980591, Richmond, VA 23219; Trinity United Methodist Church, 903 Forest Ave., Richmond, VA 23229; or Hospice Community Care, 10128 W. Broad St., Suite J, Glen Allen, VA 23060. VCU School of Pharmacy faculty, alumni and students have provided the Dr. Rx column for Richmond’s Fifty Plus magazine since December 2009. We now share those columns on the SOP website, as well, for those who might not have seen the most recent issue. Serving as Dr. Rx for June 2016 was Meredith Crumb, who received her Pharm.D. degree and Certificate in Aging Studies in May. This summer, she begins a residency with the Veterans Affairs Tennessee Valley Healthcare System in Nashville. She earned her bachelor’s degree in environmental sciences from the University of Virginia. Q. I feel as though we Boomers are aging pretty well … eating better, exercising more, taking fewer medications … but still we hear so much about age-related bias. Any advice? A. Ageism is the practice of stereotyping and discriminating based on age, most commonly against older adults and the aging process. This term was coined by Robert Butler, a geriatrician, who recognized age stereotyping as an issue as early as 1968. Age stereotypes represent widely shared beliefs about the defining characteristics of groups of individuals based simply on how old they are. While the most commonly recognized form of age stereotype is that of older adults, age stereotypes exist for any age group. Teens, for example, may be stereotyped as immature or reckless, while the elderly might be considered slow or out of touch. As you progress through life, you integrate your own experiences of aging into personal stereotypes. The social category of “older person” encompasses multiple stereotypes. Stereotypes can be positive or negative. Unfortunately, the number of negative stereotypes tend to exceed the positive. Age stereotypes can range from beliefs about physical characteristics and personality traits to social status and behavioral tendencies. While these stereotypes are based in shared beliefs, they can vary because of different personal experiences and development. Self-stereotyping occurs when you identify with a group – such as an age group – to the point that you unconsciously take on behaviors associated with stereotypes of that group. For example, whether you are an older person or a younger person, claiming to have a “senior moment” when forgetting something perpetuates one of the negative stereotypes associated with aging. Often we are simply distracted and are not giving our full attention to the task at hand; there’s no need to blame a stereotypical characteristic to explain the inability to recall information. Studies have found that self-perceptions about aging can have long-term effects on health. This means that people who hold negative views of aging may experience more significant declines in their own health, over time, than those who hold positive beliefs about aging. So start changing your negative self-stereotyping, embrace your individuality and focus on the positive aspects of aging. Stereotypes don’t have to bring you down! Media and marketers often exploit age stereotypes, perpetuating ageism. Marketing messages can induce fear in younger populations about the aging process with the goal of persuading them to buy into “anti-aging” products and procedures. There is some good news: While American culture tends to emphasize negative stereotypes regarding the aging process, there is evidence that the amount of age bias is actually decreasing. Since individual experiences and perspectives influence stereotyping, we can help fight age stereotypes and ageism by examining and challenging our own biases. Pay attention and challenge the messages that society sends about the aging process. Does a particular stereotype align with your experience of the aging process? Share your experiences with others, and start the conversation to combat ageism. 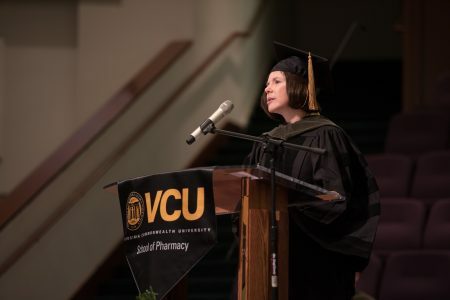 The American Association of Colleges of Pharmacy has selected VCU School of Pharmacy to receive the 2014-15 Lawrence C. Weaver Transformative Community Service Award for its significant commitment to addressing unmet community needs through education, practice and research. Representatives from the VCU School of Pharmacy will be honored for the school’s Pharmacist Collaborative Care and Outreach in the Community (PCOC) program during AACP’s Annual Meeting, Pharmacy Education 2015, at the Gaylord National Resort & Convention Center in National Harbor, Md., in July. In addition to direct patient care, faculty, Pharm.D. and graduate students and residents have conducted more than 50 research projects related to community outreach, producing 57 posters and 14 publications. Founded in 1900, AACP is the national organization representing the interests of pharmacy education. It serves 134 accredited colleges and schools with pharmacy degree programs, including more than 6,600 faculty, 64,800 students enrolled in professional programs and 4,900 individuals pursuing graduate study. Dixon is one of 15 pharmacy faculty nationwide who will receive start-up funding to complete their research, which will be presented at AACP’s Annual Meeting in July 2016 in Anaheim, Calif. He is the first VCU recipient since the award was initiated in 2011. Co-investigators in the study are Evan Sisson, associate professor, and Michael Kelly, PGY-1 ambulatory care resident. In reference to the study, Dixon notes that blood pressure normally follows a diurnal pattern, higher first thing in the morning and lower at night. The absence of a nighttime dip in blood pressure increases risk for cardiovascular morbidity and mortality. “Non-dipping” is more prevalent in African-Americans, which might explain why they are at greater risk for target organ damage. The study’s primary objective is to evaluate the efficacy of nighttime administration of two blood pressure medications, Lisinopril versus Amlodipine, in non-dipping African-Americans. Dixon, who joined the SOP faculty in 2012, focuses primarily on lipid disorders, hypertension and heart failure. He is a fellow of the National Lipid Association, a diplomate of the Accreditation Council for Clinical Lipidology and an associate of the American College of Cardiology. He is also on the Southeast Lipid Association board of directors and serves on the editorial board of the Journal of Clinical Lipidology and iForumRx.org. 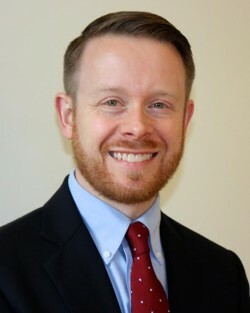 Dixon, along with Sisson and Veronica Shuford, director of educational innovation and assessment, received the 2014 AACP Innovations in Teaching Award for “Use of Video-Recorded Clinic Visits to Improve Student Pharmacists’ Clinical Interviewing Skills.” He also was named a VCU School of Pharmacy Outstanding Preceptor in 2013. Dixon earned his Pharm.D. degree at Campbell University and completed a primary care residency at Charles George VA Medical Center in Asheville, N.C.
Dean Victor Yanchick chats with SOP alumni Janet Silvester and Eric Edwards. 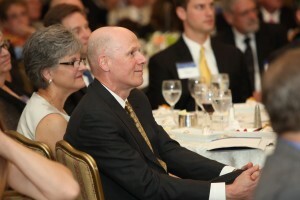 More than 350 VCU School of Pharmacy alumni, faculty, residents, students, preceptors, friends and family convened May 29 at Richmond’s Jefferson Hotel to mark the passing of an era. The VCU Pharmacy Gala celebrated Victor A. Yanchick’s 18 years of leadership as dean and Joseph T. DiPiro’s appointment as new dean. Rao also congratulated the School of Pharmacy on having been fortunate enough to attract DiPiro, who most recently served as executive dean and professor for the South Carolina College of Pharmacy at the University of South Carolina and the Medical University of South Carolina. 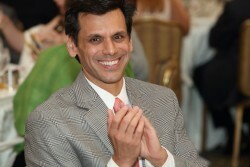 VCU President Michael Rao joins in the applause for Deans Yanchick and DiPiro. Sheldon Retchin, senior vice president for health sciences and CEO for the VCU Health System, said he’d never seen the Grand Ballroom so packed. ““It’s rare that you have deans travel this far!” he joked. 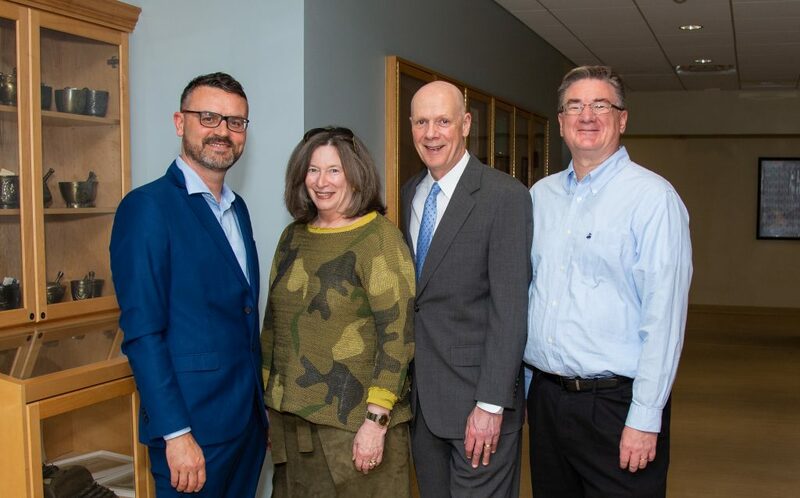 Robert Blouin, dean of the University of North Carolina Eshelman School of Pharmacy, was on hand, as well as Lynn Crismon and James Doluisio, current and emeritus deans of the University of Texas at Austin College of Pharmacy. VCU School of Dentistry Dean David Sarrett and the School of Nursing’s retired dean, Nancy Langston, and current dean, Jean Giddens, also were in attendance. 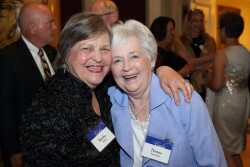 SOP alumna Bertha Rolfe (left) catches up with Donna Yanchick. 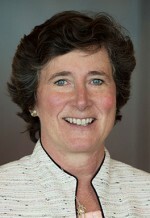 Lucinda Maine, executive vice president and CEO for the American Association of Colleges of Pharmacy, called the gala “a night full of institutional awe.” Yanchick was one of her first AACP officers and later served as AACP president, while DiPiro was editor of the AACP-produced American Journal of Pharmaceutical Education for 12 years. Other highlights included tributes to Yanchick by two of the deans (Doluisio and Langston), three pharmacy alumni (John Beckner, Preston Hale and Janet Silvester), a current colleague (Jeffrey Delafuente, SOP associate dean for academic affairs) and Yanchick’s son Jeffrey. Ellen Carfagno, SOP director of development, served as emcee for the gala, and the Hon. Harvey Morgan, also an alumnus, offered the invocation. Incoming Dean Joseph DiPiro and his wife, Cecily, enjoy a few words from SOP alumnus John Beckner (not pictured). Crismon, who counted Yanchick among his mentors, presented gifts from the University of Texas; School of Pharmacy alumnus Al Schalow read an original poem; and a painting by School of Dentistry alumnus W. Baxter Perkinson was presented by Ellen Byrne, senior associate dean with the School of Dentistry and an alumna of pharmacy, dentistry and medicine. The VCU Pharmacy Gala was made possible by donations from presenting sponsors MCV Foundation and the School of Pharmacy. Table sponsors were Bremo Pharmacy, Carthan F. Currin Jr., George Emerson, L. Preston and Barbara Hale, MCV Alumni Association, Pfizer Consumer Healthcare, U.Va. Health System, VCU Alumni Association, VCU Health System Pharmacy and Walgreens. 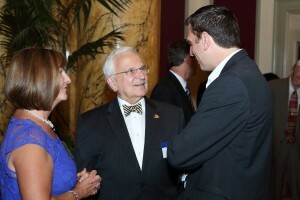 See more photos from the VCU Pharmacy Gala!